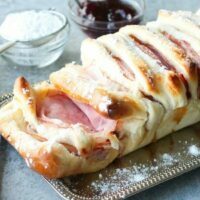 Monte Cristo Pull Apart Bread - Dessert Now, Dinner Later! 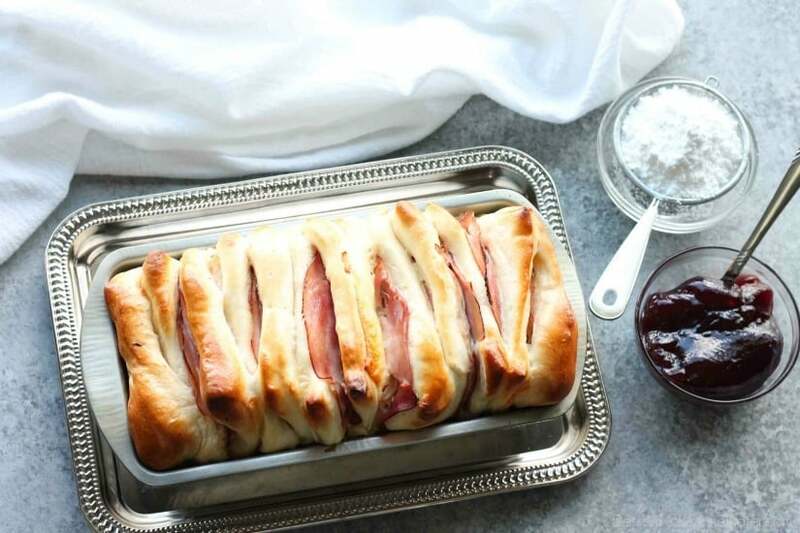 This Monte Cristo Pull Apart Bread is full of savory meats and melty cheese. It’s topped with a dusting of powdered sugar and served with raspberry preserves. 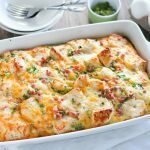 Works great as a breakfast, lunch, dinner, or appetizer! 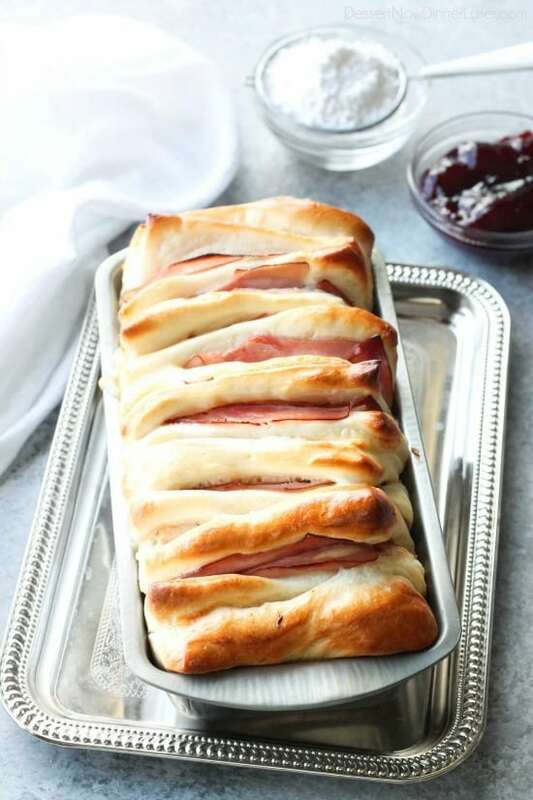 I’ve always been intrigued by the Monte Cristo sandwich. It’s high on my “to try” list the next time I go to Disneyland in the Cafe Orleans. There is just something about a sandwich cooked up like french toast and served with powdered sugar and raspberry preserves that simply makes my mouth water! 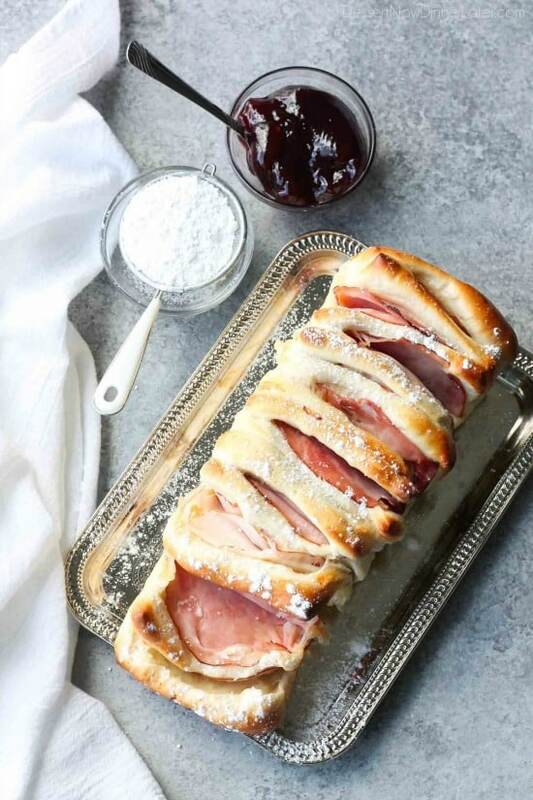 Salty-sweet combinations have always made my mouth happy, so I thought I would take inspiration from a Monte Cristo Sandwich and twist it into this pull apart bread. We can’t quite figure out what meal of the day it works best for, so I figure you can eat it whenever! 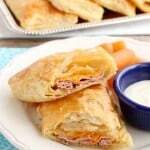 A typical Monte Cristo is a fried ham and cheese sandwich, which is a variation of a French croque-monsieur. Disneyland makes it with ham and turkey, which is what I did. If you top a croque-monsieur with a fried egg it’s considered a croque-madame, which means this totally works for breakfast, even without the egg. 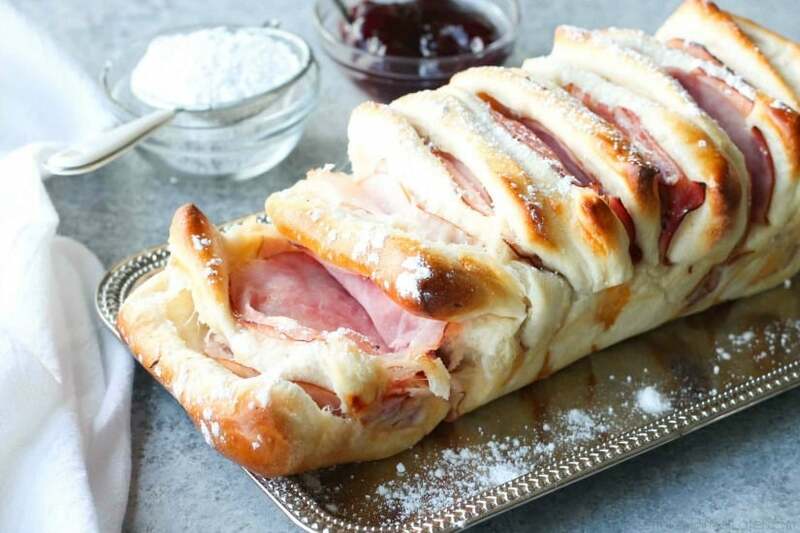 No matter how you look at it, this Monte Cristo Pull Apart Bread is fun to share with your family. When you pull it apart, it’s almost like an open-faced sandwich, and it’s awesome warm from the oven. 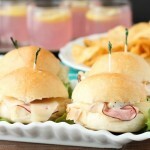 I mean, there’s nothing like fresh bread straight from the oven, but fresh bread with ham, turkey, and melty cheese?! Perfection! Recipe added 12/19/2016. For a step-by-step photo tutorial, visit the Rhodes Bake-N-Serv Blog. Roll out the thawed bread dough into a large rectangle about 16x20-inches. Using a pizza cutter, cut the dough into twelve pieces (3x4 rows). 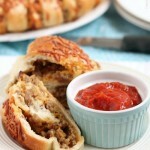 Top each piece of dough with a half slice of Swiss cheese. 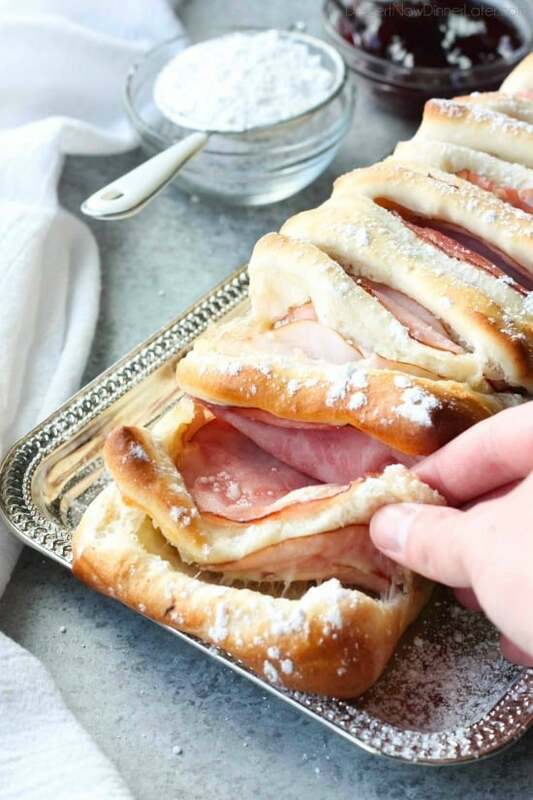 Pat the lunchmeat with a paper towel if it is extra moist (this helps the bread bake better). Top the cheese with two slices of turkey. Top the turkey with two slices of ham. Stack all of the pieces of bread, cheese, and lunchmeat on top of each other, creating a tower. Lay the stack sideways into a greased bread pan. Cover with plastic wrap that has been sprayed with cooking spray and let rise for 30 minutes at room temperature. Alternately let rise in the refrigerator for an hour. Bake at 350 degrees Fahrenheit for 25 to 30 minutes or until the bread is done where it touches the meat and cheese. Brush the top with butter and serve with powdered sugar and raspberry preserves. Refrigerate any leftovers. Enjoy! This bread sounds amazing! My family would love it! What a clever idea! I am going to try this recipe at home.